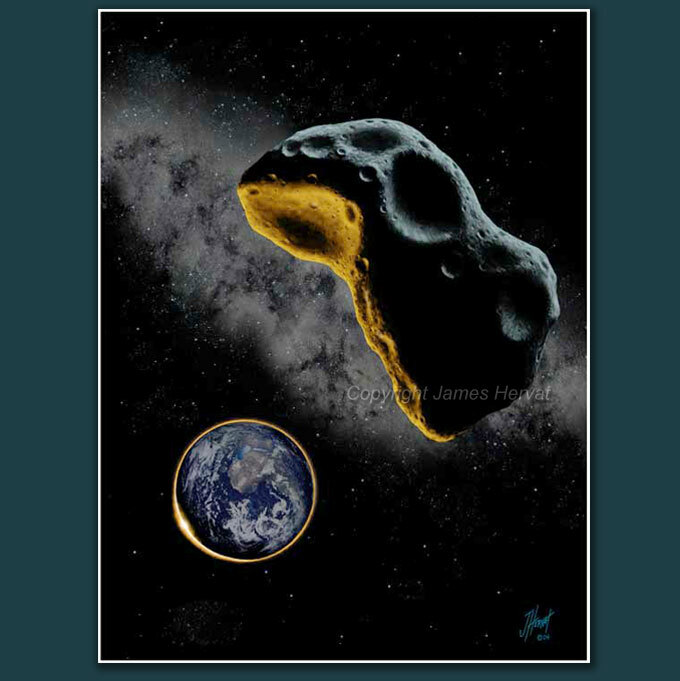 Near Earth Object by James Hervat - A rogue asteroid slips into Earth's shadow as it wanders close to our planet. Near Earth Object (2009) - Astronomers are carefully monitoring Near Earth Objects, lesser solar system bodies that intrude on our planet's personal space. The inner solar system in which we reside is littered with countless asteroids and meteoroids, smaller rocky remnants left over from the creation of the sun and major planetary bodies. Comets also frequently visit the inner solar system-- icy objects that originate from a cloud far beyond the orbits of our larger, outlying planetary cousins. The accretion of this debris billions of years ago not only formed the planets but may have also delivered the carbon-based molecules and water that enabled life itself to gain a foothold on our own infant planet. These visitors from space can end life as well. There is much evidence suggesting that impacts of sufficiently large examples of these bodies on Earth are also responsible for one or more mass extinctions. While the object widely held culpable for the Cretaceous-Paleogene event (the dinosaur-killer) was estimated at 6 miles across, the impact on land of an object only the size of a small building today would certainly get our attention. Here, a sizable asteroid slips into the Earth's shadow as it wanders perilously close to our planet. Will future technology enable us to avert a collision? NOTE: the watermarks on the above image do not appear on the prints.